So long summer…until we meet again. Hello, fall. We’ve missed you. As warm, long days give way to crisp mornings and earlier sunsets, it feels like a good time to reflect a bit and enjoy the beauty of the new season. Our circadian rhythms are ready. Are you? You don’t have to imbibe in booze, brats and burgers during Oktoberfest season. 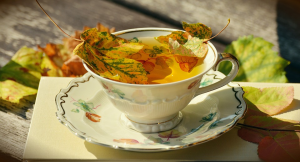 Fall is a natural time of transition which means it’s a good time to re-energize with a cleanse. A cleanse means different things for different people, but it wouldn’t be a bad idea to cut sugar, dairy, alcohol and caffeine as a starting place. Cleansing helps boost your mood and immune system. It may be tough to tackle at first, but your body will thank you later. Or, just take advantage of all the autumn bumper crops, such as apples, winter squash, mushrooms and sage. Get creative with recipes like pumpkin pie tamales. Farmer’s markets are still abundant at this time of year in some parts of the country, as well as corn mazes/pumpkin patches (which usually offer some fresh produce, as well as fun outdoor family activities). Time to go check out the fresh produce before the stands close shop for this season. It’s time to bust out the pumpkin and gourd decor that you can’t wait to put out every year. Catching up with friends over pumpkin spice martinis with cinnamon candles burning in the background sounds like a good way to usher in the new season. Maybe your fall party involves picking apples, or other fruits and veggies, or something more sinful like making yummy Halloween desserts. So many options, so little time. If you took advantage of Labor Day sales and bought some awesome new patio furniture, it would be fun to host a fall equinox or Halloween party for your friends to showcase your new goods. The noticeably cooler temps and shorter days are nature’s way of telling us to slow down. But that doesn’t mean you shouldn’t have an outdoor garage sale or hit some new hiking or biking trails you’ve been wanting to check out with your dog in tow. Taking in the colorful foliage while out for a more casual hike or ride is one of the best things about exercising during Fall, especially with friends or a partner. It gives you a chance to reconnect with them and stay fit. Don’t forget the layered clothing. Some of us exercise fanatics take advantage of this time of year because we are reaping the fitness benefits of a summer racing season. Cyclocross is a classic fall sport and a really fun event to try if you haven’t done it before. What’s not fun about riding your bike through mud, jumping over barriers with your bike hoisted over the shoulder, ringing cowbells, and drinking beer between laps? Cooler weather also lends itself to running races and personal best times. Football season is the best. Either going to a game or watching one on a TV in the parking lot, nothing brings families together like food, drink and sports. There’s something comforting about bundling up and watching rough and tumble football. Part of being a spectator means tailgating or even “homegating,” which refers to all the entertaining merchandise needed for the Saturdays and Sundays at home watching games with friends and family. Buy a ball and bat set for the kids and dig out that old football for the grownups, and you’ll set yourself up for a great autumn afternoon. Fall flies by in a flash, so don’t forget to jump in a pile of leaves, go for a hayride, and eat caramel apples while you can.